High-end features at an upper-mid-range price make the Oppo R7 Plus great value, but a relative lack of processing power and RAM compared to the competition mean it comes up short in terms of ultimate performance. Ever since we first went hands-on with the Oppo R7 Plus in China, I've been waiting to put it through its paces more thoroughly. Back then we were impressed with the flagship-level specs, performance and features, but most of all with the apparent price, which would have put it firmly in the mid-range price band. Now the Oppo R7 Plus has arrived, and it's a little more expensive than we anticipated at £319 SIM-free. So, with the OnePlus 2 already in the marketplace and in roughly the same price band, how does the Oppo R7 Plus hold up? The inspiration for the Oppo R7 Plus is clear – hold it up to an iPhone 6 Plus and it's immediately obvious that the Chinese manufacturer has worked hard to ape Apple's flagship. This is a shame in many respects, because the Oppo R7 Plus is more than capable of standing on its own two feet, and the slavish mimicry rather cheapens the overall effect. Oppo's imitation of Apple isn't limited to the hardware either. Its ColorOS build of Android (5.1.1 at the time of this review) shamelessly copies many of the visual cues of iOS, from the deep-space wallpapers to the camera interface. From camera screens to wallpapers, the iPhone influence runs throughout ColorOS. Put the obvious comparisons aside, though, and you're left with a well-designed if unspectacular-looking handset. Oppo's gone for a mix of curves and corners that work well together, the former on the rear making the phone sit comfortably in your hand and the latter giving your fingertips something to grip around the front of the screen. There are two colour options – silver and white, and the gold and white one tested here – and they feature an aluminium unibody construction that's generous on the brushed metal. The Oppo R7 Plus feels solidly put together, too, and despite its size I was never worried about it flexing or breaking. On the subject of size, it is big – the 6-inch screen puts it firmly in phablet territory and, thanks to the scalability of Android, it never feels like a simple upscaling exercise. The screen might not stretch all the way to the edge of the frame, but it gets close enough that you're never aware of significant dead bands. The Oppo R7 Plus has a 6-inch AMOLED screen, and unsurprisingly it's the first thing you notice about the phone. Fully six inches in size, and with a resolution of 1920 by 1080, it's a sight to behold. It's not just good on paper, either – it's evenly backlit, and bright enough to be decently visible outdoors in the sun, too. The viewing angles are generous and, as you'd hope on a handset like this, movies and games look incredible. You can save up to five fingerprints for unlocking the handset, and Oppo's ColorOS responds swiftly and fluidly. There's no way of replacing in-app passwords with a fingerprint, but you can use it to encrypt apps if you want, adding an extra layer of security. On the subject of ColorOS, Oppo promises a smoother, faster Android experience. Given that the phone features 3GB of RAM and an octo-core processor, you'd expect a seamless user interface anyway, but it certainly doesn't harm matters. 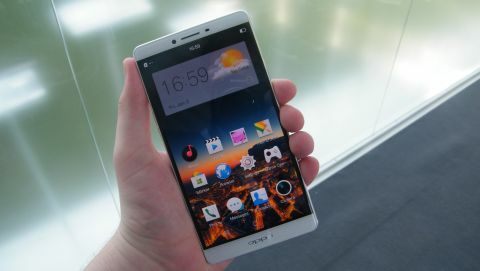 More than a launcher with a few gimmicks, Oppo's gone beneath the bonnet of Android to tweak and streamline the OS. This means you're stuck with ColorOS, even when you install and run other launchers on top of it – ColorOS continues to run at full steam in the background. In light use, you won't notice the performance hit – there's enough headroom to enable the third-party launcher to run smoothly alongside everything else. But start opening multiple apps and the RAM being consumed by both ColorOS and whatever other launcher you favour starts to become a factor. Other highlights include support for two SIMs, or a single SIM and microSD memory card to expand on the 32GB internal memory, and fast charging. Oppo promises 20 minutes of talk time on just five minutes' charge from empty, and this appears to be accurate – from dead I got between 15% and 20% on the tests I ran.